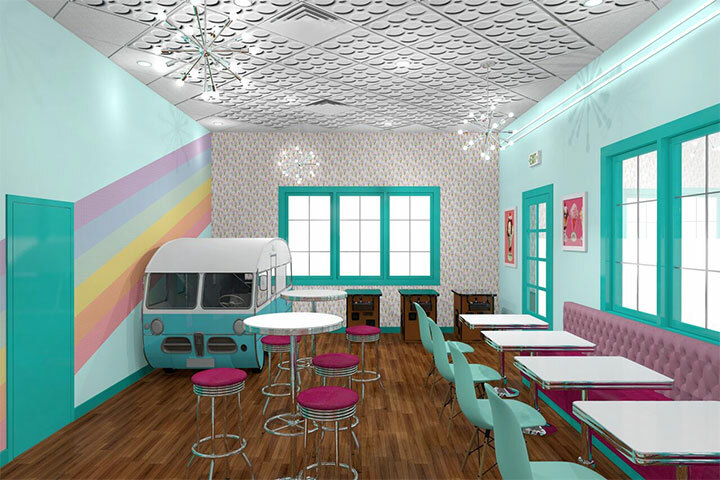 We completed another project in Liberty Station, this time a frozen yogurt shop interior design that we seasoned with a pinch of mid-century nostalgia. 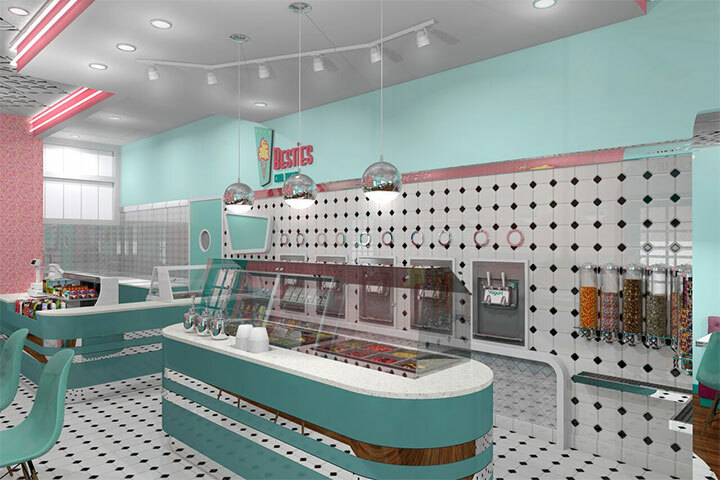 The store name, Besties Cool Treats, evokes images of lasting friendships and stories shared across the dessert table. We kept the design of the store in step with this idea of friendship – colorful, playful and unique. We decided on a main chromatic palette of turquoise blue and pink pastels, mixed with a few additional soft colors. However, we used the occasional strong, vibrant hue to infuse this delicate color combination with life and vibrancy. 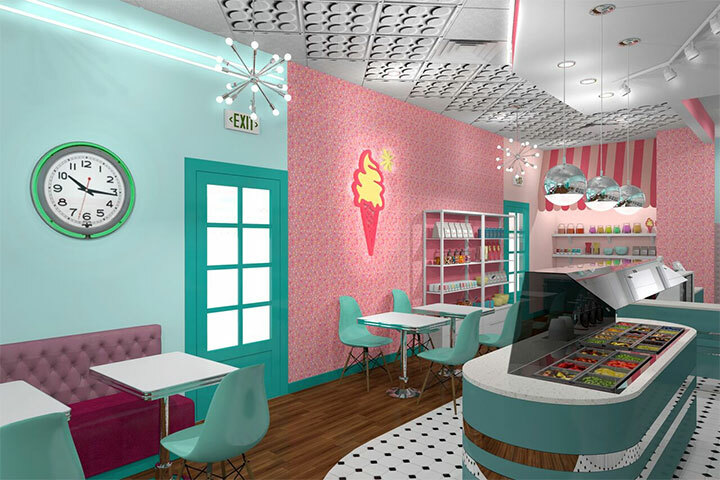 We found this was a fitting choice for a frozen yogurt shop interior design. The blue tones suggest the freshness of the cold treats, while the pink hues call to mind sweet fruit aromas. 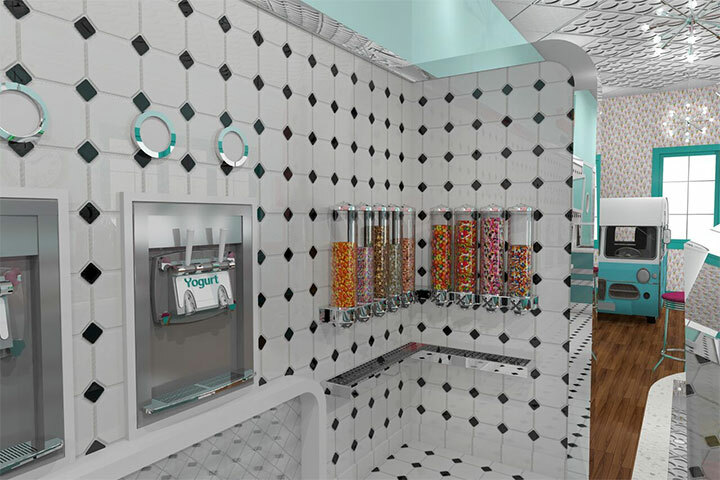 If yogurt lovers first eat with their eyes, the store interior offers them the perfect visual treat. The idea of “cold and fresh” is reiterated throughout the store by the smart use of finishes. The tile is snow-white, while the reflective band around the counter calls forth images of a frozen lake. The metallic globes of the light pendants with their cold and clean light reflections play on the same note. The furniture pieces take a hint from the interior design of the 50’s diners, with their metallic table and stool frames, colorful benches, curved counter and Sputnik starburst chandeliers. The modern chairs balance this nostalgic retake on mid-century design, keeping it fresh and uncrowded. In the middle of this mix of hard tile and metal surfaces, the wood floors flow around the counter into the sitting area, bringing in the warmth of natural finishes. In a corner, bathed in a colorful sun ray, the body of an ice-cream truck brings back childhood memories. On the opposite side, a striped awning above a wall niche talks of warm summer days. A Mindful Design Consulting creation, the pastel-colored wallpaper takes on a triple role. As a customized wall finish, it gives the space a unique look. As part of the branding effort, it makes this look highly recognizable. Finally, the logo pattern helps the first-time customer remember the name of the store. We kept the store’s logo simple, pairing its iconic frozen yogurt cone image with playful letters and pastel tones. A careful eye recognizes the star elements of the logo in the starburst chandeliers we used in the interior design. 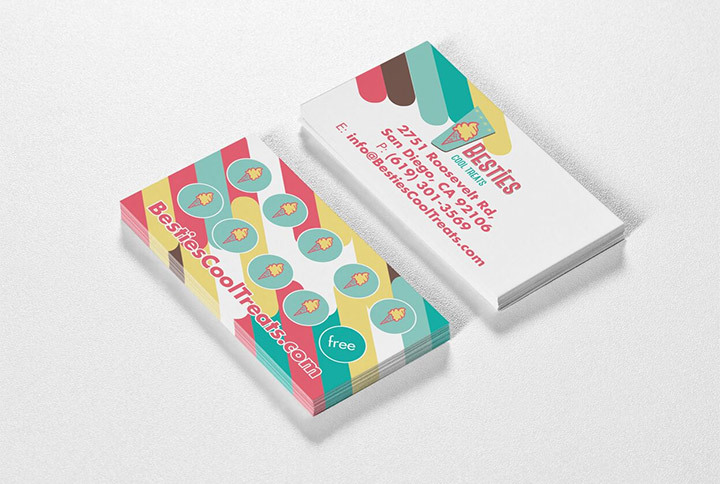 We used the same colors, graphics and simplicity of concept when designing the Besties Cool Treats business cards. 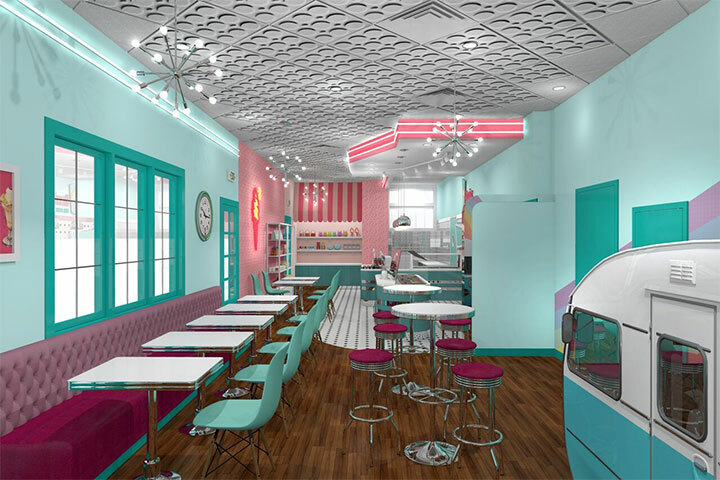 Combining old and new elements, this frozen yogurt shop interior design finds inspiration in the past, yet succeeds in keeping the space fresh and new. It is an excellent metaphor for the very idea of friendship – old, yet always ready to offer more joy.